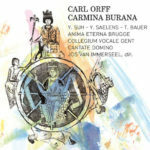 Carl Orff (1895-1982) acquired instant fame after the premiere of his ‘scenic cantata’ Carmina Burana on 7 June 1937 in the Frankfurt Opera. A mixed choir, boys’ choir and three soloists sing of the fickleness of fate, accompanied by the orchestra. Orff’s combination of the unadulterated texts by itinerant medieval students (‘goliards’) and a modern, direct tonal language full of movement and rhythm seemed to strike a chord with audiences, and made the piece one of the twentieth century’s most compelling box-office hits.